Glori Zeltzer is a licensed marriage and family therapist with a full time private practice in Ventura, California specializing in relationship counseling. 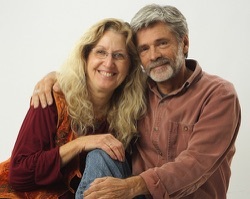 For over thirty years she has guided individuals and couples on their journey toward joyous and passionate relationships. Glori passionately believes that through experiencing others on a deep personal level we learn to appreciate our sameness, and embrace our few differences. Leon Berg is a founding member of the Ojai Foundation, an educational sanctuary in the Upper Ojai Valley. He is a Senior Facilitator and Trainer in the Way of Council and has been facilitating Council groups in the U.S. and abroad for the past 20 years. In 2001, he went to Israel to seed the practice of Council among Israeli Jews and Arabs, co-founding the Israeli non-profit organization Ma’agal Hakshava (Listening Circles). Leon has returned to Israel and Palestine many times since to conduct Council trainings and to lead a variety of coexistence programs.